To make the dough, place the mozzarella and the cream cheese in a heat safe bowl and microwave for 1-2 minutes or until the cheese is entirely melted. Stir well. Add the almond flour, egg and salt and using a hand mixer, combine well. Place a greased piece of parchment paper on a pizza stone (or cookie sheet, but a pizza stone will bake the bottom better). Put the dough on the greased piece of parchment paper and pat out with your hands or rolling pin to make 4 squares about 4½ inches by 4½ inches. Make the filling by placing the butter in a skillet on medium heat. Add the spinach, garlic, red peppers, scallions and salt in a saute pan. Saute for 2 minutes or until spinach is wilted. Place this mixture down the middle of each square. Top with feta cheese. Fold the square in ½ to make a triangle. This dough is forgiving, so if you see a hole, just press together with your fingers. 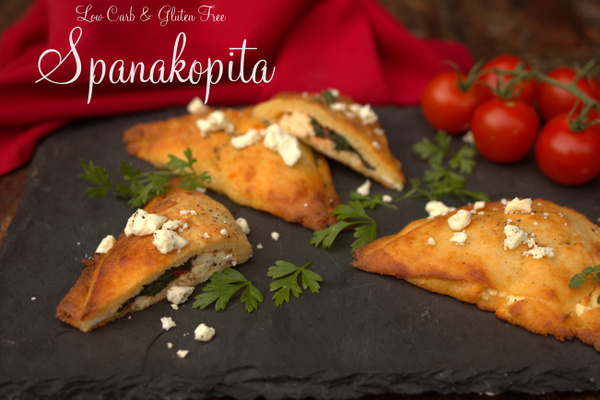 Place the stone with the spanakopita into the oven to bake for 10 minutes or until the dough is golden brown and dough is fully cooked. Remove from oven and allow to cool. Once cool, drizzle with Primal Kitchen Greek dressing and garnish with herbs.